Well things are a lot better. We are in NY and she loves this huge backyard, she just runs a lot. There is a family of squirrels who live in the trees and she has fun chasing them as they make their daily run from tree to tree then off to other yards. She chases the birds too, goofy thing. My boyfriend adores her, but unfortunately he does not know how to work with her, and when I have to school her, he interferes. I had to take her down one day and he got upset, I told him it has to be done she growled at me. We discovered she had a type of mange when we got here and it has done a job to her fur. She is almost completely over it. I had to bath her every day for about 10 days and she hated it, but it had to be done. Here are some new up to date pictures, but she looks like a German Shepard now though. She still jumps on people and likes to mouth our hands. I am able to get her to stop the mouthing by saying enough, she quits and gets calm. Jeff is still trying to tell her to sit or don't bite. I try to not control her in front of him as he feels I interfere between them. I am going to try to get him to take her to an obedience class. 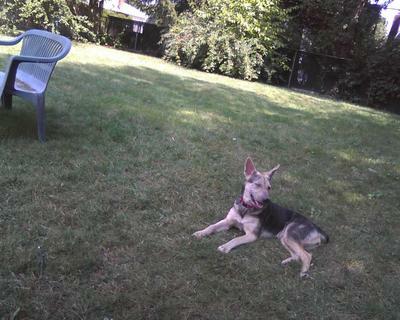 This picture is her lying restfully in the middle of the back yard, which has a privacy fence all the way around it. She gas the sun/junk room to live in, and it can be heated for winter or she will be brought inside for extreme cold. She is still extremely destructive though. Process of the studies and education is compact and complete in all perspectives and connotations. Knowledge is utilized and used for the best dissertation writing betterment and effectiveness. Goals and aims are organized and set to the motion for the permanent and excellence. It is rigorous and inquisitive.